As your Sarasota and Venice new homes specialist, I work with a lot of people who are unfamiliar with the process of purchasing a new home. Here are some answers to common questions, and some things to look out for. Your Sarasota and Venice new home search made easy. Home site selection: The advertised price usually does not include what is known as a "lot premium". Some of the builders in our local market do list spec homes in the MLS with an all-inclusive price. A lot premium is usually applied for a preserve view or a lake view. Those can run between $10,000 and $60,000, in addition to the price of the actual home. Negotiability: In real estate everything is negotiable, but less so in new construction. In our local market, the builders know they will sell out because of a shortage of resale homes. From time to time, I post updates about builder incentives which include discounts on lot premiums and designer upgrades. I will help you try to negotiate any and all terms with the builder whenever possible. Using your own agent: As your new home specialist, I represent your interests. The builder sales associate is working for the builder. There is no difference in price to you when you have your own Realtor represent you. Even if you have spoken to someone in a new home sales center, you can still have your own agent. In fact, a case could be made that the builder reps prefer working with buyers who have their own agent. Keeping up with new construction: The first new home in Rapalo in Venice FL. Sale of current home: Many buyers have to sell their current home to buy a new home. The builders will usually not write a contract with a sale of home contingency. 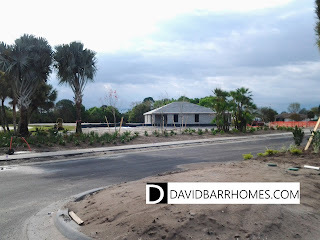 Once your current home has all contingencies removed, you should be ready to go with your selection of new home here in Sarasota or Venice. Price increases: Time is of the essence. Builders increase prices over time as demand increases. One builder in our area increases prices after a certain number of homes are sold. Don't be surprised if a price quoted to you three months ago is no longer valid when you are ready to move forward. If you're in the market for a new home, let me be your guide and representative. 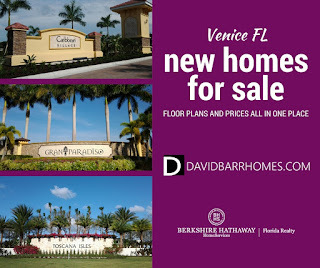 Visit www.davidbarrhomes.com or sarasotahomesforsale.us and click on "New Homes" in the main menu.